A great fanmade fighting game based on Dragonball Z, one of Japan´s most famous manga/anime series. 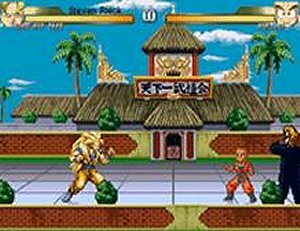 The game is based on M.U.G.E.N., a powerful 2D fighting game engine that lets you create your own fighters, program their special moves and various attacks, and string them together with backdrops to form a CAPCOM-style 2D fighting game. Although it is 2D, it is the best DBZ game ever. Not only do you get most of the favourite DBZ characters in this game, you get to make the game from very easy to very difficult. There is a great deal of customization (power level, music) that you can do with this game engine. It runs without complex graphics or great demand on even older computers. The only drawback is the difficulty to make more characters, I would like to see more GT characters, even though it might defeat the name of the game. Adding characters such as Baby, Super 17 or various Shenrons would not hurt.